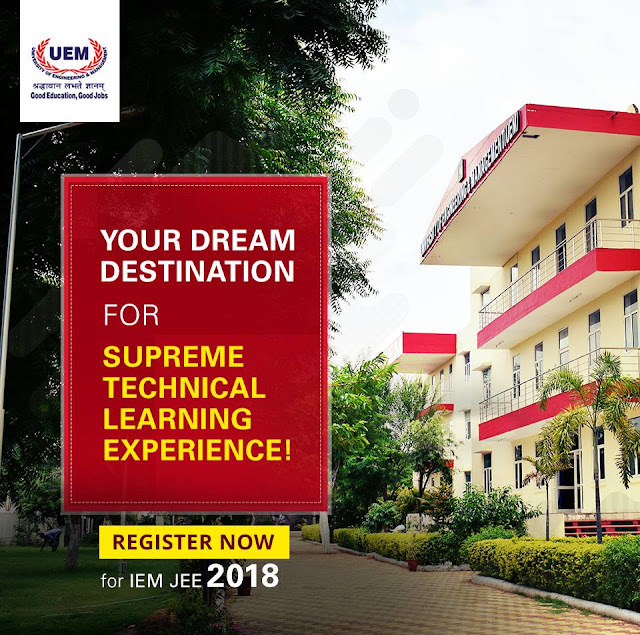 University of Engineering and Management (UEM) was established in Kolkata in 2014. The university aims to encourage the spirit of free enquiry and imagination. UEM has won ‘AAA’ category in the NPTEL program. The university has one the most efficient placement cells in the country. Every department has a curriculum that informs and trains the students about the latest development in that field.To maintain the standard of education, the departments continuously upgrade the curriculum. They try to make the students capable of dealing with changing trends in the field. Education is dynamic in nature and innovation is promoted. Students learn to develop a disciplined yet advanced approach to their careers as professional. Researchers and teachers all help the students with their problems. • Candidates need to be between the age group of 17 – 25 years to apply for the exam. • The candidate must have passed 10+2 from a recognised board. • Candidates should have physics, chemistry and mathematics as compulsory subjects. • The applicants must secured minimum 60% marks in aggregate in the above-mentioned subjects. • Applicant must have secured at least 30% marks in English. • Eligibility criteria for SC, ST and PWD candidates is 45% marks. For admission in the post graduate program of Master of Technology (M.Tech.) in any field of specialization, candidates need to qualify in GATE / PGET / Any other National Level or State Level Exam. For students that do not have any such qualification an entrance test is conducted on campus. The candidates have to also face Group Discussion and a Personal Interview to secure admission. For Masters in Business Administration (MBA) the candidate must have qualified CAT / MAT / WBJEMAT or any other such state or national level exam. And, for students that do not have any such score card an entrance test is conducted on campus. The candidates also have to clear Discussion and a Personal Interview. Candidates who are qualified in JECA (West Bengal) orany other National Level or State Level Exam in computer application can apply for admission in Master of Computer Applications (MCA) program. Other candidates can also opt to appear in the entrance test taken on campus by the university. They will also have to face a Group Discussion and a Personal Interview before admissions are finalised. For enrolling in the PhD program of the university the candidate will have to appear in an entrance test.